If you’re in need of new office lighting for your business or home office in Atlanta, Georgia, turn to the professionals at NorthPoint Office Furniture. Since 1994, we have served residents of the Atlanta Metro area with their commercial and home office needs. 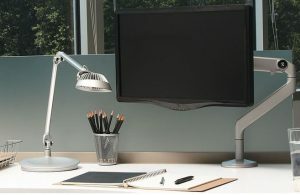 We have a large inventory of high quality new and used furniture at budget-friendly pricing, and we now offer task lights by Humanscale, the leading designer and manufacturer of ergonomic products for the workplace. So if you want sustainable office lighting for your home or business in Atlanta, GA, that will increase comfort, save energy, and look great, come visit NorthPoint Office Furniture. At NorthPoint Office Furniture’s local showroom, you’ll be able to see a variety of office lighting options, as well as any other furniture you may need for your Atlanta-area office. We can even help you with planning out your office space and make recommendations based on your preferences and budget. To learn more about the office lighting options and office furniture available for your home or business in Atlanta, GA, contact NorthPoint Office Furniture, or stop by our conveniently located showroom.